Well, it seems Daryl was right. 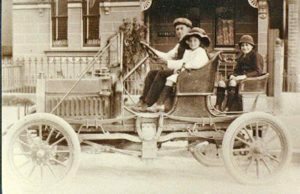 Grandfather Cropper did have a Buick and, as the photo shows, it was a 1908 Model 10. Now in normal trim Flint made 4002 model 10’s in 1908 and these were fitted with a 4 cylinder engine, 3.75 ins. X 3.75 ins., equalling 165 cu. ins. developing 22.5 h.p., propelled through a 2 speed planetary transmission and stood on an 88″ wheel base, wearing 30″ X 3″ tyres. All of this is impressive but Grandfather Cropper and his mate were into the inventing bit and believed they could do wonders for the ride, hence the modified suspension which was believed to have been patented by them. Reports have it that it really worked well, but it is hard to describe their invention and a close look at the photo will illustrate this point. Daryl put me in touch with Auntie Edna who confirmed all the above. She also told me that Grandfather Cropper and his mate developed many things together, including another ride improvement consisting of “S” shaped spring steel spokes in the wheel. Grandfather Cropper came to Australia in 1898 and made his mark as an engineer, specialising in leather tanning machinery. Auntie Edna recalls that Grandfather Cropper also owned an early Darraq and a Moline car. Story has it that one day in George Street, Sydney, whilst driving the Darraq, a policeman ran up alongside Grandfather Cropper, pulled him over and booked him for speeding – yes, ran up and pulled him over!!! Story also says that after the policeman completed the formalities of the dangerous infringement, a well dressed gentleman stepped from the footpath and handed George Cropper his card, stating he would speak for George if he needed him to, the card nominating that the gentleman was an official of the Transport Department. Makes one wonder does the quota system go back that far. The photo is believed to have been taken in 1911 outside the family house in Stanmore. 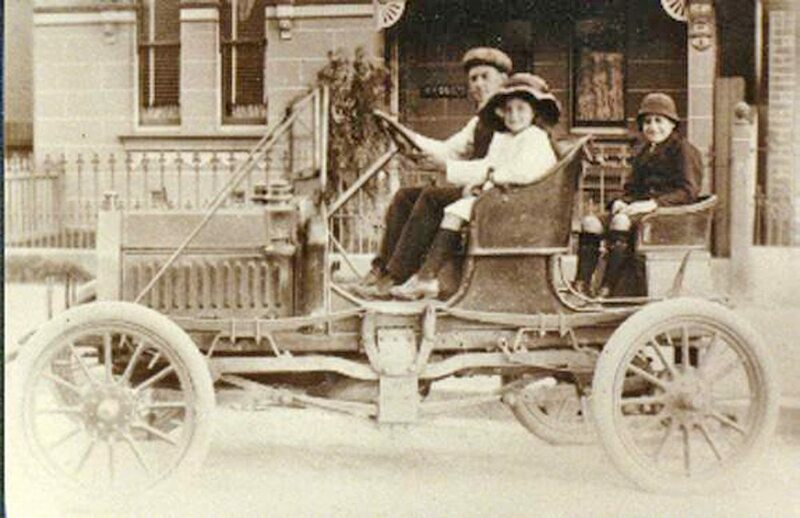 Pictured in the car is Grandfather Cropper, Daryl?s mother and his uncle. Appreciation is expressed to Daryl Badman and Edna Cropper for providing the picture and allowing the story to be told.